Ah, the dilemma of the five-star review. What can you say to convince other people to read a book you now hold near and dear to your heart, when all you really want to do is buy a bunch of copies of the book and fire them directly at people’s heads with a slingshot? Ugh, The Diviners is so, so good. I hadn’t read Libba Bray before, but I can see why people luhrve her. Also, talk about not pulling the same trick twice—read the blurbs for some of her other books, and you’ll see how wildly they all differ from each other. Clearly, I need more Libba Bray in my life. I love a spunky heroine. I can’t get enough of precocious, lippy chicks who don’t bend to society’s rules. Evie O’Neill is brazen—so brazen she gets kicked out of her hometown in Ohio and shipped off to live with her bachelor uncle in 1920s New York City. And oh my gosh, could the city BE more glamorous than it is through Evie’s eyes? I’m visiting NYC soon myself, and as I listened to Evie’s story I had to keep reminding myself I’m not going to 1920s New York City. There won’t be speakeasies and flappers with bobbed hair and people saying, “Gee, Mister.” More’s the pity. And if I may further gush, what about that audio version though?! Reader January LaVoy does pitch-perfect voices for every single character. I never once wondered who was speaking, and that’s saying something because it’s a pretty big cast. My favorite was Theta, the throaty-voiced Ziegfeld girl who sounds just like April from Parks and Rec doing her Janet Snakehole impression. Oh yeah, and the plot. I forgot to talk about the plot. There is a plot! A good one! Evie’s uncle runs a museum of the occult, and it turns out Evie has some paranormal powers of her own that she’s trying to keep quiet about. But then they get embroiled in a murder investigation, and the killer may be someone—or someTHING—much scarier than they ever expected. So there you have it. 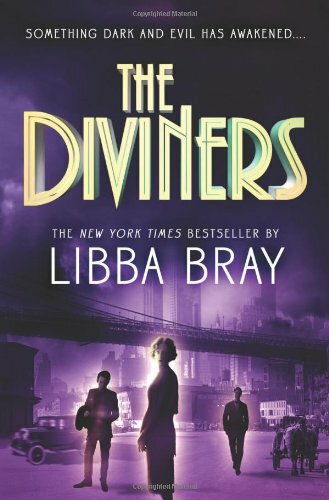 Five huge, slobbering stars for The Diviners by Libba Bray!